The Great Horned Owl, (Bubo virginianus), also known as the Tiger Owl. The largest owl in North America. Our Vergill (two-year bird), weighs 1,5 kg and has a wingspan of 1,3 meters. As the only one at the demonstrations he cuts a dash by picking up prizes thrown in the air. Snowy Owl (Bubo scandiacus) The bird is also known in North America as the Arctic Owl, Great White Owl or Harfang. 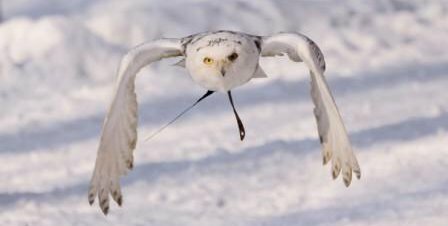 The Snowy Owl is the official bird of Quebec. This yellow-eyed, black billed white bird is easily recognizable. Weight from 1,6 to 3 kilograms. The adult male is virtually pure white, but females and young birds have some dark scalloping; Białek is a 4 year old male, recently got a new friend - a young male named Snowy. Eurasian Eagle-Owl (Bubo bubo) Resident in much of Eurasia. Probably the world's largest owl. Wingspan of 138–200 cm, weights from 1.75 kg ( females) to 3.2 kg (males). In Poland, lives only about 300 pairs. Cuba is the largest owl presented at the demonstrations. 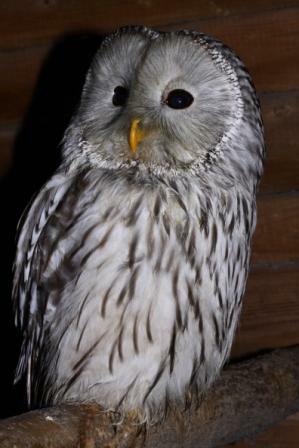 Ural Owl (Strix uralensis) to Poland came from the east and is now a very expansive species displacing our native owls. On the photo male Yurii. Brown Wood Owl, (Strix leptogrammica) South Asian medium sized owl, living in dark, humid forests. On the picture Oli. 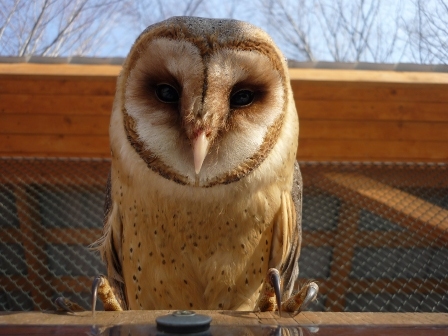 Barn Owl (Tyto alba), medium size, slender, brightly feathered with long legs, size of a large pigeon (33-40 cm). Wingspan of 85-98 cm. The distinctive white, heart-shaped facial disks. On the photo Tytus.